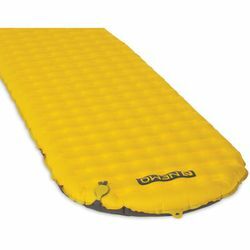 NEMO Tensor Ultralight Sleeping Pad. Offering quieter, more supportive sleep at a tiny packed size, Tensor™ ultralight sleeping pad stands apart as the ultimate backcountry adventurer’s best friend. Updated with a zero-profile, micro-adjustable valve and included Vortex™ pump sack, NEMO's lightest sleeping pad uses premium 20D fabrics to shave grams without sacrificing plush comfort.